The history of Dantica Cloud Forest Lodge starts with its name. 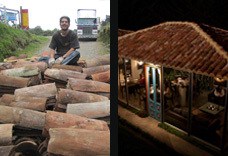 The founders and owners of Dantica ecolodge are a Colombian – Dutch couple, Maria Luisa Castro Fernández who is a textile designer, and Joost Wilms who is a tropical ecologist. When Joost was finishing his studies in 1992 he had to do fieldwork in Costa Rica and resulted to study reforestation with frugivorous birds in the Cloud Forest of San Gerardo de Dota. He fell in love with the place, not knowing he would be coming back 10 years later to built an ecolodge with his new love, Maria Luisa. 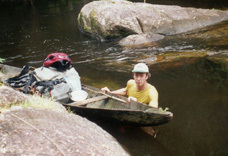 After finishing his studies, Joost went to study Tapirs (Dantas) in the medio Caquetá region, the Colombian Amazon, during one year for a pilot study with the University of Amsterdam. He had to work closely with different indigenous tribes to visit the sacred ´salt licks´, places rich in minerals where many animals come to eat the soil. He worked mainly with the Andoke tribe, where he soon got the nickname Dantica (ing´tha in Andoke), meaning little tapir. It is therefore no surprise that the lodge has the tapir as its logo, with tapirs actually living in its forest! After this study he started to buy indigenous art all over Latin America and soon met his wife, Maria Luisa, in Bogotá, Colombia. She worked with different ethnic communities and indigenous tribes in Colombia, designing new products for them using the traditional techniques. 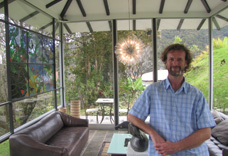 They decided to move to San Gerardo de Dota to open a small cloud forest lodge and a gallery on a 20 hectare forest reserve with some clearings, where they are committed to sustainable tourism. It was for them a perfect match, combining biology, indigenous art and design to create a little paradise high up in the cool mountains. 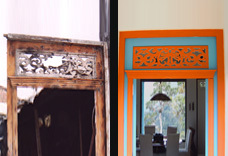 They started constructing in 2003, beginning with their house, where they opened the Dantica gallery in the living room, and two Bungalows for rent. During the following 14 years, they expanded it into an ecolodge with 12 Bungalows, a large gallery with restaurant, an employee house, a playground and a laundry house. The constructions were made according to the respect for the environment because sustainability is very important for this cloud forest lodge. The clearings in the forest and along the road already existed and where used for blackberry cultivation. It started with the design of the buildings, focused on a colonial style that fits in the beautiful natural settings of the area. 200 To 300 year old colonial doors, windows and tiles where shipped from the Colombian highlands to San Gerardo de Dota, to give the constructions this typical colonial look from the outside. Secondly, they wanted to give their guests the feeling they are in the cloud forest 24 hours a day, so all the buildings where made with lots of glass; large windows from floor to ceiling to give you a direct contact with nature, combining the natural light and breathtaking views with a modern design. And in the third place the forest was respected, so there has only been built in the clearings, not one single tree has been cut and the design of several Bungalows is based on the space that was available between the trees left in the clearings. In this way they have created a little jewel in balance with nature, where you can enjoy your vacations in comfort and luxury, while being in direct contact with this magnificent and endangered ecosystem, the magnificent oak dominated cloud forests of the Talamanca range. 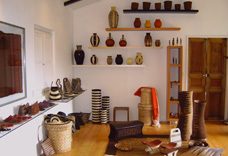 In 2009 they opened a second gallery in Playa Herradura, near Jacó, in 2012 the third gallery opens its doors in Moravia, San José and in 2017 the fourth in Jacó. Joost and Maria Luisa live now between San Gerardo de Dota and Playa Herradura, with their two children Sophie and Laurens, 12 and 11 years old. The valley of San Gerardo, Copey County, Dota District, San José Province, is located on the Pacific slopes of the Talamancan mountain range. Nowadays it is situated inside the Los Santos Forest Reserve and the Los Quetzales National Park, between 3.025 and 2.000 meters above sea level. There is a 9 kilometer long road that enters the valley at the top end, at 3.025 meters. There are two small rivers, the Ojo de Agua and the Savegre, they come together near the bridge and continue as a larger river called the Savegre, reaching the sea near Quepos. The forest is categorized as Upper Montane Cloud Forest, dominated by oak trees (Quercus spp.) that grow up to 50 meters and can live over 500 years. 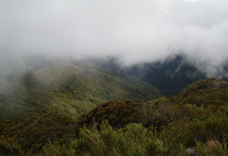 These forests often experience a diurnal presence of clouds, which is why they are often called “cloud forests”. The specific atmospheric humidity regime of these forests represents one of the main factors that cause the large array of differences in forest structure and functioning when compared to other tropical forests. Not so long ago this valley was pristine, without inhabitants. In the 1950´s the first family, Chacón, arrived here crossing the mountains from the west, from Copey and Santa María de Dota and were soon followed by other families like the Dada, Monge and Serrano. At the beginning they dedicated themselves to cattle ranching and later agriculture and carbon production, cutting down the forest on both sides of the river. There was no road and the valley was only accessible by foot or horse. The Cerro de la Muerte –summit of death- earned its name making many victims who tried to cross the mountain from the Central Valley to the South by foot, unable to withstand the torrential rains at the Paramó. At the end of the Second World War, 1944-1945, the United States built the Pan-American highway, connecting the United States with the Panama Canal. Because the Pan-American Highway only passed nine kilometers from the Chacón family they decided to connect the valley to the Highway, digging a road up the valley by hand. Of course this changed a lot. The Chacóns are the pioneers in tourism in this region and the first visitors started to arrive in the early 70´s. A little later, in 1975, the valley was declared part of the Los Santos Forest Reserve. Both tourism and the protected status helped to stop the destruction of the forests. The growing community gave the valley the name of San Gerardo de Dota. In the 80´s several families started to cultivate rainbow trout, introduced in Costa Rica from Panamá (originally from the US and Canada), and nowadays it is one of the main sources of income after ecotourism. 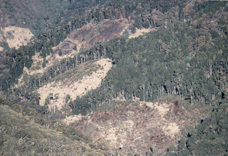 After the formation of the Los Santos Forest Reserve the forests were protected, only in the formerly cleared parts were construction and cultivation allowed. Tourism was increasing mainly because this valley is one of the best (if not the best) places in the world to see the resplendent Quetzal (Pharomachrus mocinno), sacred bird that was worshipped by the Aztecs and Mayas. In 2006 the Los Quetzales National Park was created, the newest National Park in Costa Rica and open to public since July 2008. The mountains on both sides of the valley of San Gerardo are now part of this National Park.